A solution for different applications and industries: the filling and packaging systems at Swiss Can Machinery AG shows how this objective can be achieved. The Swiss company turns to stainless steel motors for the actuators, for example when these systems are used for pharmaceutical products. Motors with Washdown Food coating are used when the hygiene requirements of the food industry are crucial, along with “completely normal” synchronous servo motors in areas with low requirements related to food safety. The benefit of this concept is that the entire control technology including motion control can be retained, which ultimately reduces the development time significantly. 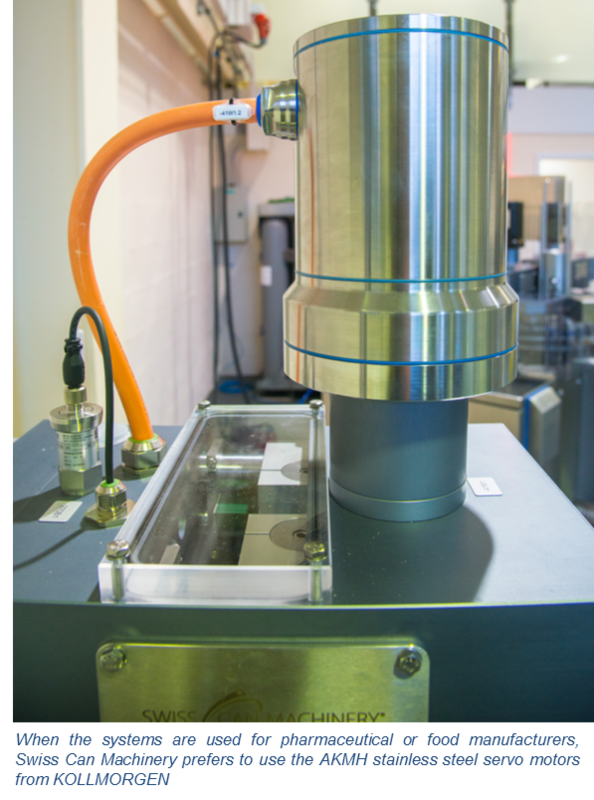 “With the motors we were looking for a manufacturer that would supply us with convenient motors and also with a high-hygiene version. One set of motors is for standard machinery construction and the other motors are for machines used subsequently in pharmaceutical manufacturing. 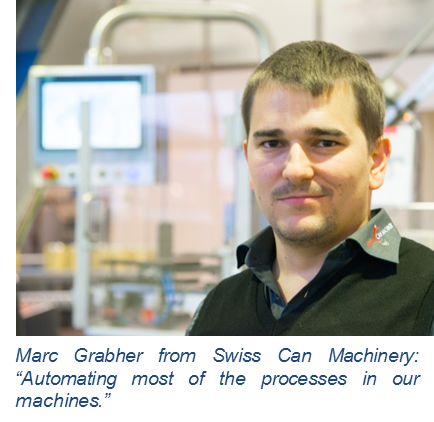 This is how we ultimately came to KOLLMORGEN in our search for stainless servo motors”, says Marc Grabher, Technology Director at Swiss Can Machinery, regarding the beginning of their collaboration with Kollmorgen. He remarks that access to an extensive range has the advantage that motors can be exchanged very easily without losing time in engineering. 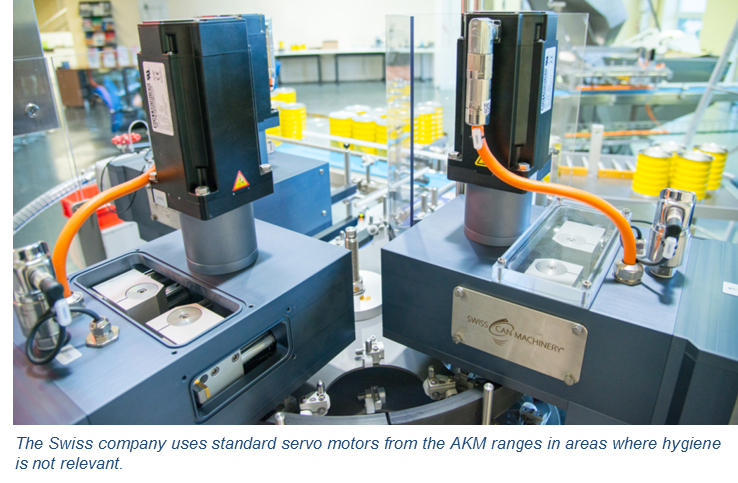 Swiss Can uses different synchronous servo motors with single-cable connection technology from KOLLMORGEN, means that the basic programming for a system can be retained, irrespective of whether the systems are being used for filling coffee or milk powder. The machinery installation with just one cable between the AKD servo controller in the control cabinet and the selected motor in the machine also remain unchanged. Swiss Can Machinery could alternatively resort to the biggest common multiple in relation to the equipment use for all application cases. Yet this would mean using technology that is totally excessive for many applications and would therefore be too expensive. “Different ranges of machinery are also not an option for us because we are just too small for that”, explains Marc Grabher. The mechanical engineer founded the fast growing company in Berneck by Lake Constance in 2013 together with his brother Michael. Given this narrow focus, the packaging specialists were looking for suppliers that were able to cover the widest possible range of uses for development of their filling, transportation and packaging modules based on scaled technology. 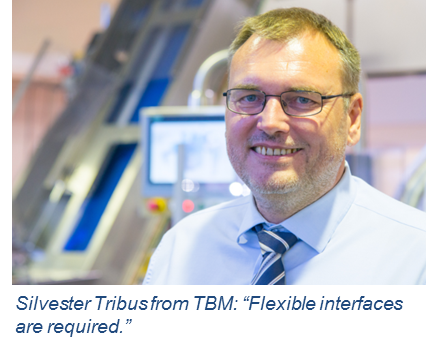 “When we look at the whole picture in terms of automation, then we are dealing with machines that are the same in relation to the control engineering, but which just need to have their motors adapted”, says Silvester Tribus. The CEO of TBM Automation AG based in Widnau provided intensive support to Swiss Can with the engineering as a channel partner of KOLLMORGEN. In practice for instance access to the stainless steel motor from the KOLLMORGEN AKMH range is reduced at most in order to fit a flange. “We could not find any comparable manufacturer with such a consistent range available that is right for us”, highlights CTO Marc Grabher. Aside from the time saved in development, the OEM and operator equally benefit from the consistency in the control cabinet based on the high degree of standardization, which also limits the effort and expenditure related to provisioning spare parts. “We can cover a wide range of completely different tasks with one single AKD servo controller”, says Silvester Tribus in summary. Typical tasks completed by the Swiss company’s machines include filling with powder, specifically special milk powder for babies who for instance have kidney diseases. “We’re talking about products that can cost 100 euros for a 900 gram can”, says Marc Grabher regarding the market where his company’s systems are in demand internationally. They are so successful because the relevant well-known machine builders are very good for filling high-speed lines of between 200 and 300 cans a minute, but they are far too inflexible and are too big and expensive when it comes to smaller production quantities. Production batches that change frequently with different filling quantities and varying types and sizes of containers: this is precisely where Swiss Can Machinery demonstrates its high performance levels time and time again. The systems have a compact design with their production output of between 20 and 80 cans per minute, and they can also be modified very easily while saving time. This makes them an attractive option for companies that manufacture highly priced special products that change frequently in comparatively small quantities. 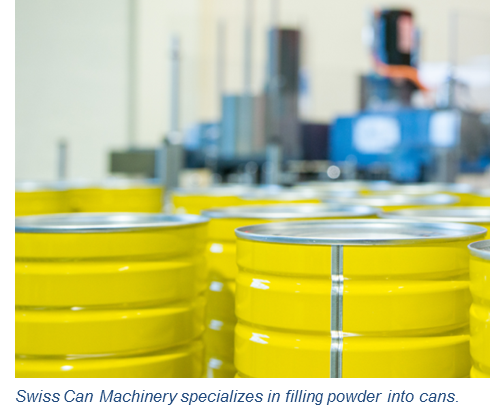 “Milk powder is a difficult product to fill into cans. It can feature very different filling properties depending on the recipe, fat content, drying method, granulation and degree of fineness”, says CEO Michael Grabher. He notes that corresponding knowledge and expertise are required to construct machines that are capable of filling the milk powder cleanly, precisely and efficiently into the cans. According to its own statements Swiss Can Machinery spent a lot of time on the electronics and automation when developing its production line. “The proportion of employees specializing in automation is growing in our company”, explains Marc Grabher. “We want to build modern machines in which most processes run automatically. As a Swiss company the standard related to quality is correspondingly high, particularly in terms of hygiene and efficiency”, is how his brother Michael describes the strategy. Efficiency means getting to grips with the modifications required in the form of adjustments to the format following a product change while saving time. 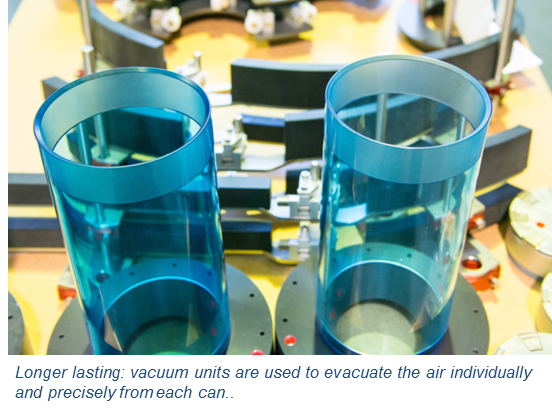 “The can seaming process involves technology that is more than 100 years old. The competition is accordingly tough”, both agree. The design for complete format sets plays a vital role in reducing unproductive conversion times. These are uniformly color-coded as a set. The machine operator just needs to exchange a complete color in the event of a product change with different packaging. “This prevents any mix-ups and makes the conversion process faster and safer”, states Marc Grabher. The colors do not involve any languages, which turns out to be a real advantage with exports. Given that the milk power market is an international one, Swiss Can Machinery also faced the challenge at the early development stage that continental practices with the control technology were an additional factor in terms of the relevant national language. Swiss Can uses a Siemens S7 1500 as its standard PLC, although it does allow for conversions to another particular controller type and manufacturer based on customer requests. The Swiss company is able to offer this level of flexibility without complex adjustments to the programming and communication because the process control itself is separate from the motion control. 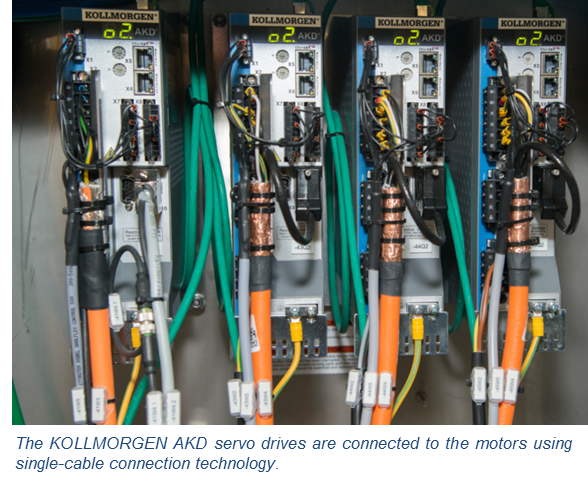 The motion control operates in the AKD servo controllers from KOLLMORGEN and in future will run in the Motion Controller PCMM for tasks requiring greater computational intensity. The small device is also used in lots of other applications as a central transmission point between different communication ¬protocols. Swiss Can for instance connects the AKD servo drives to the controller via a Modbus. The interfaces in particular between the drives, PLC, motion and further actuating elements such as the sensor system are generally a major issue in machine construction. “You spend hours on this”, says Danijel Todorovic, project manager at TBM, from experience and from the close collaboration with Martin Rupf, application engineer at KOLLMORGEN in the Swiss region of Neuhausen am Rheinfall. “There is often a fear of the interface, which is why flexible interfaces are required”, highlights Silvester Tribus. For Marc Grabher challenges such as these are the reason why his company attaches so much importance to intense cooperation with system partners. “We know how we want our machines to look and what they need to do. Yet we need support with connecting the control technology so that we can configure machines and deliver more quickly”, says the technical director.